Our Nissan Navara ute features a VK45DD enegine mated to the six speed Navara manual gearbox driving an R51 Pathfinder IRS. This is all held together by a scratch built one of a kind chassis built by The Lab Limited to help lower the vehicle to its 6″ lower than stock stance. It features a ~115L fuel tank giving reasonable range despite the V8s tendency to consume fuel at an alarming rate! The rear tray is extensively modified to increase width to fit the ten inch wide rear wheels while still allowing the lower ride but maintain full suspension movement. A full twin 2.5″ stainless steel exh system gives an impressive sound often attracting the “what’s in that! ?” from all walks of life but quiet enough not to wake the whole neighborhood when she’s leaving early for the track. The Navara has been on the road for over three years now with minimal trouble, a friction plate in the clutch showed it was not up to the task & recently the hood release cable seized – due to lack of use!! 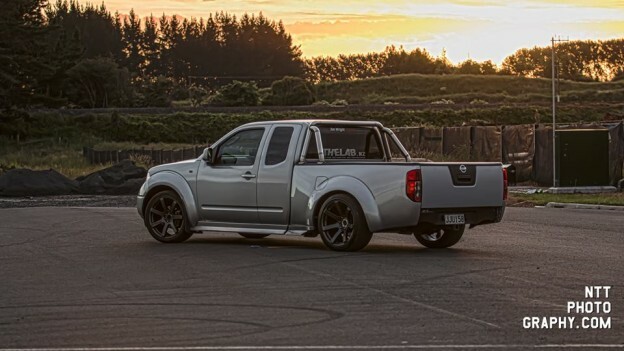 We have completed a number of engine conversions on Nissan utes, all performing very well & relatively trouble free.